Discussion in 'Community Forum' started by EC, Feb 12, 2019. WOW! The carrier that launched Dolittle's Raiders B-25s bombing Toyko in April, 1942. 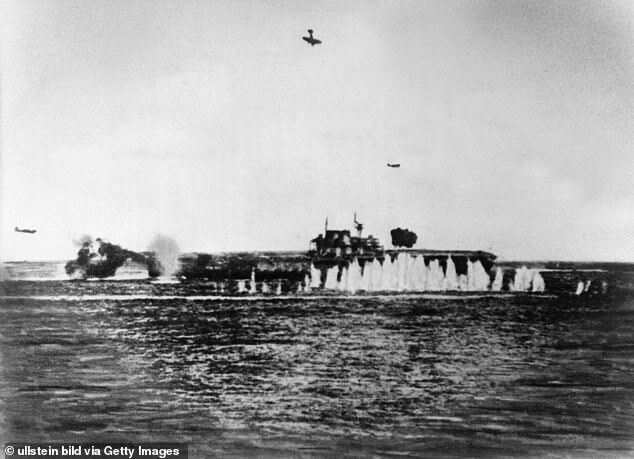 The USS Hornet was lost in the Battle of the Santa Cruz Islands in October, 1942. 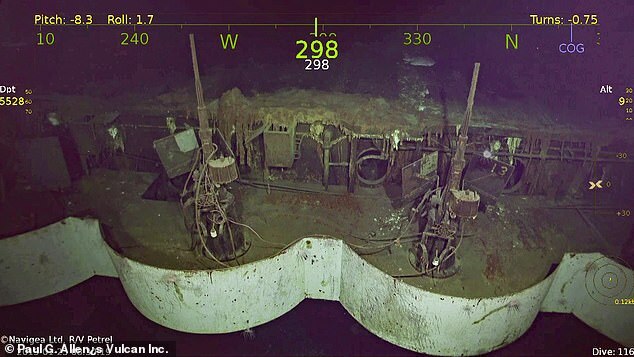 The wreck of the World War II aircraft carrier USS Hornet has been discovered in the South Pacific, 77 years after Japanese forces sunk the ship in a fierce battle. 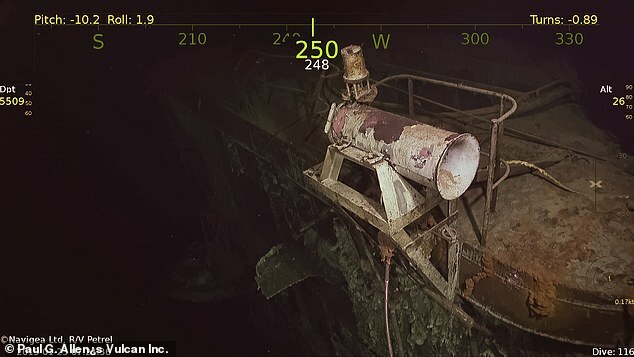 The research vessel Petrel, owned by the estate of late Microsoft co-founder Paul Allen, discovered the Hornet three miles under the ocean surface off the Solomon Islands late last month. 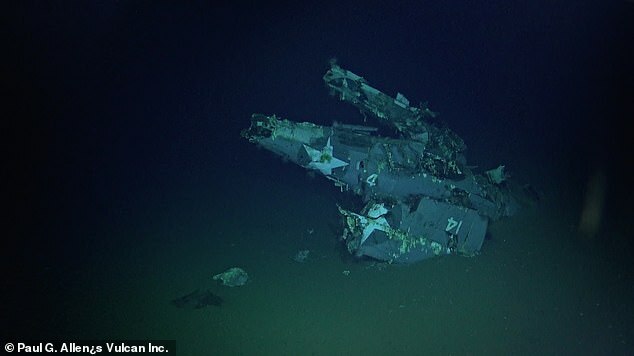 The Hornet, the last U.S. fleet carrier to be sunk by enemy fire, lost 140 hands under a relentless Japanese air bombing attack at the Battle of the Santa Cruz Islands on October 26, 1942. As Imperial Navy surface forces closed in, all hands were ordered to abandon ship, and the Hornet was finished off by enemy torpedoes and sent to its watery grave. 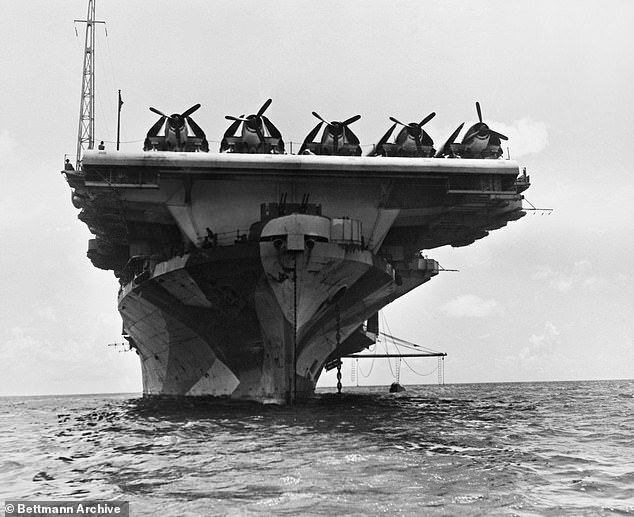 The Hornet was a Yorktown-class carrier, best known for launching the Doolittle Raid on Tokyo and participating in the Battle of Midway. 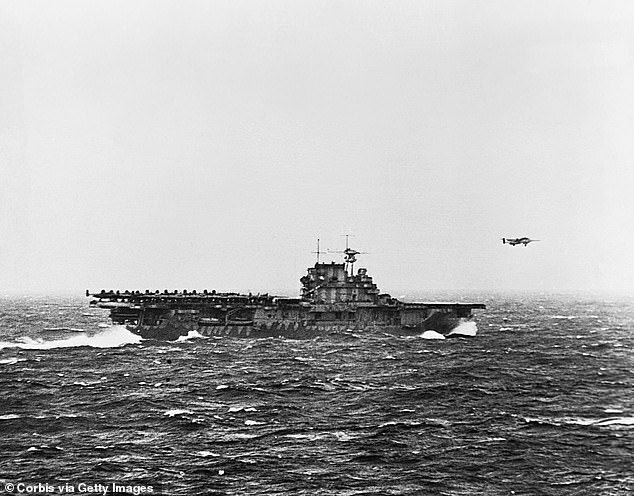 'With the loss of Hornet and serious damage to Enterprise, the Battle of Santa Cruz was a Japanese victory, but at an extremely high cost,' said Rear Admiral (Ret.) Samuel Cox, director of Naval History and Heritage Command, in a statement. 'About half the Japanese aircraft engaged were shot down by greatly improved U.S. Navy anti-aircraft defenses. 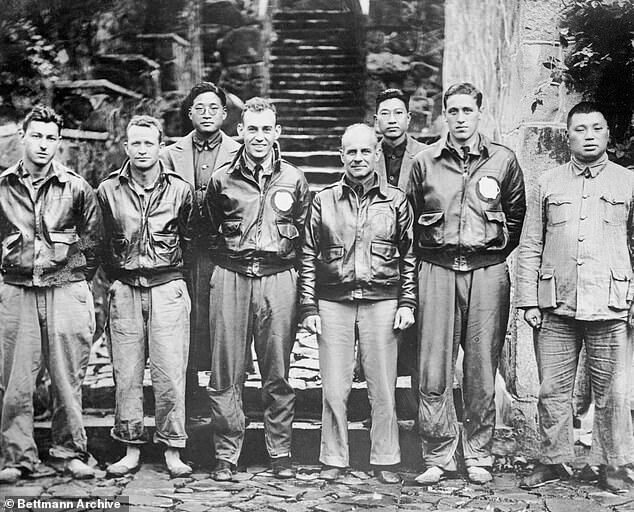 Asa result, the Japanese carriers did not engage again in battle for almost another two years,' Cox said. 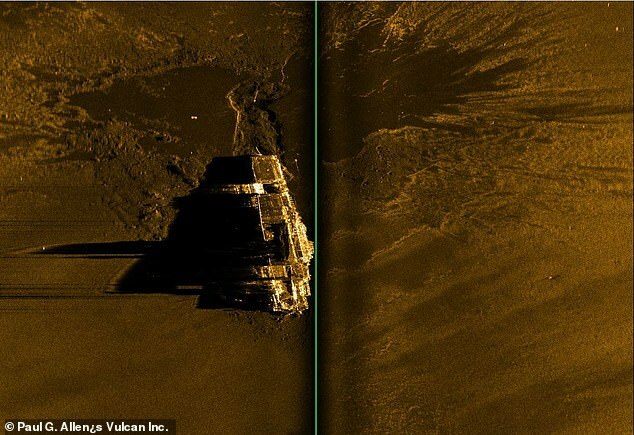 To locate the wreck, the 10-person expedition team on the 250-foot R/V Petrel pieced together data from national and naval archives that included official deck logs and action reports from other ships engaged in the battle. Researchers charted positions and sightings from nine other U.S. warships on a chart to generate the starting point for the search grid. 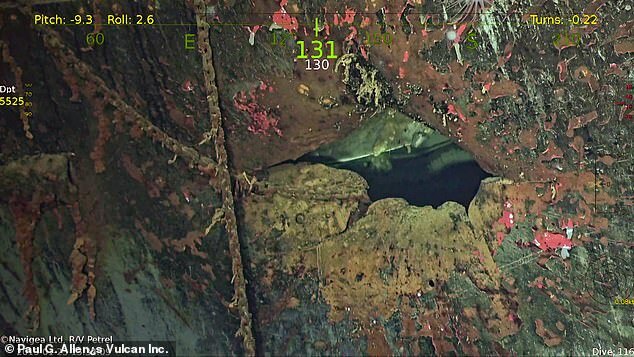 Video footage from a remotely operated vehicle confirmed the wreck when the Hornet's designation, CV-8, showed up on camera. 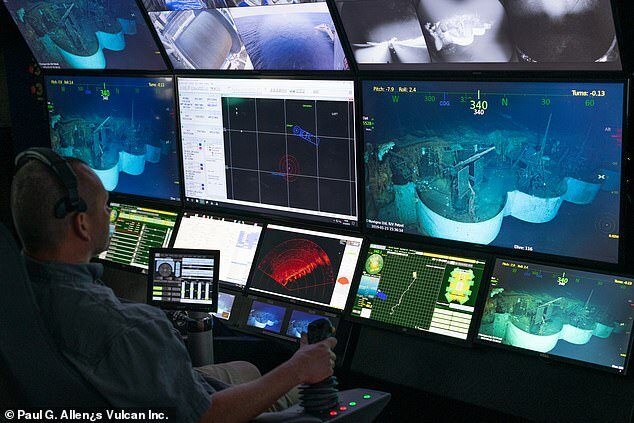 'We had Hornet on our list of WWII warships that we wanted to locate because of its place in history as an aircraft carrier that saw many pivotal moments in naval battles,' said Robert Kraft, director of subsea operations for Vulcan, the organization that operates the Petrel. 'Paul Allen was particularly interested in historically significant and capital ships, so this mission and discovery honor his legacy,' Kraft said. 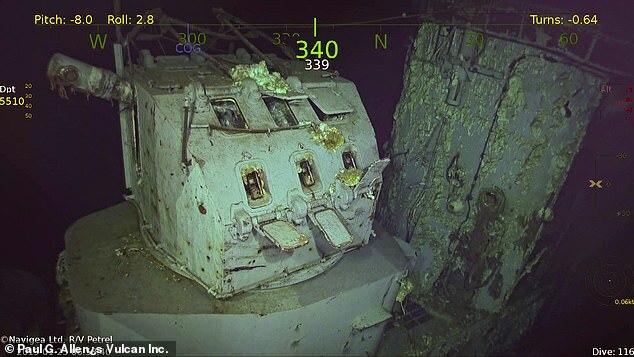 Images from the sunken wreck show gun turrets and other images from the deck of the carrier, as well as pieces of Allied aircraft. 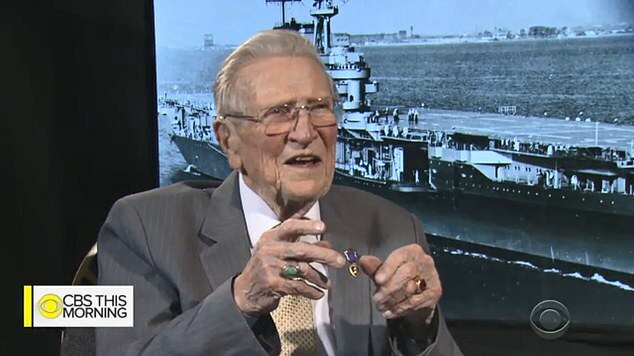 Richard Nowatzki, now 95, was an 18-year-old gunner on the Hornet, and watched via remote camera link as the remote sub discovered his old station at a gun turret. 'If you go down to my locker, there's 40 bucks in it, you can have it!' he told CBS News. 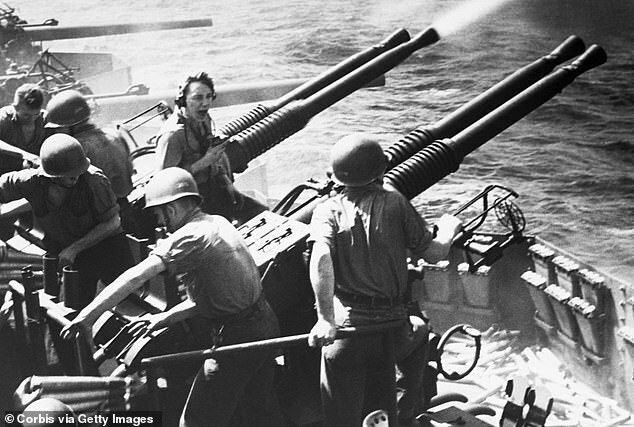 Nowatski recalled the terror of battle, as Japanese dive-bombers and torpedo planes relentlessly pummeled the ship. 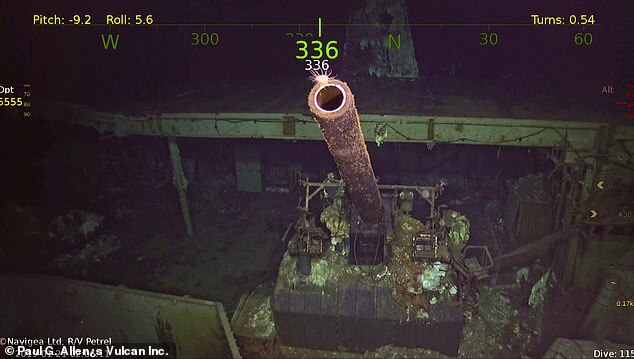 'They used armor piercing bombs, now when they come down, you hear 'em going through the decks … plink, plink, plink, plink … and then when they explode the whole ship shakes,' he said. 'When they left, we were dead in the water,' he recalled. Though most of the ship's crew of about 2,200 survived the battle, 140 perished. Ataulbe1 and bigbonner like this. 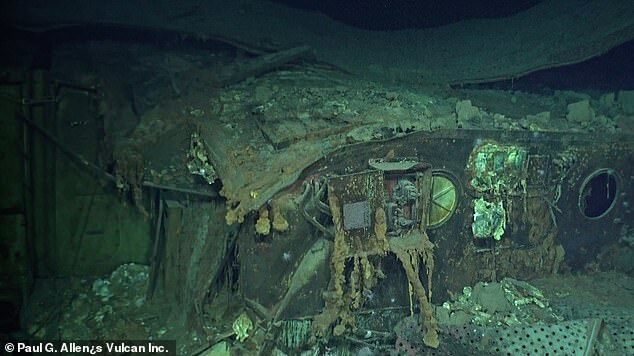 I can’t believe the ship didn’t sink when Doolittle’s Raiders came on board. Giant brass balls weight a lot. Seriously, aeronautically, what they did to even take off, was nearly impossible. Then the dead reackoning over the ocean, bombing, and navigating by basic AM radio beacons to primitive airstrips in China. Can’t believe they could even walk. carnivore and bondhu like this. Yes...it was a remarkable feat. One of my favorite books growing up was "30 seconds over Tokyo" by Captain Ted Lawson. 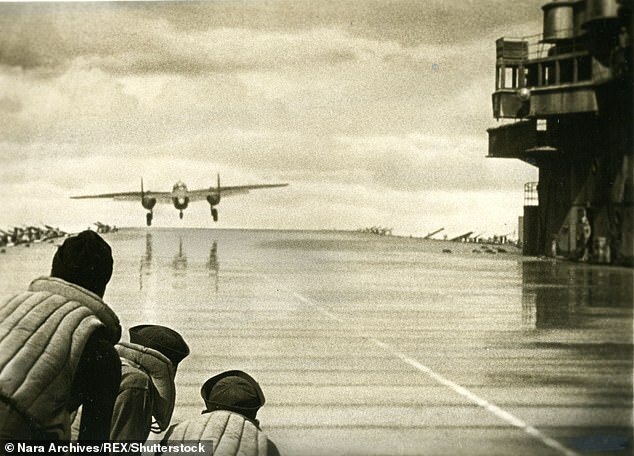 His B25 was christened the "Ruptured Duck". In the 25 years my father was a fighter pilot the one thing he never had to do was was land or take off from a Carrier.. In the 25 years my father was a fighter pilot the one thing he never had to do was was land or take if from a Carrier.. I've had Navy fliers tell me it is like trying to land on a moving, rolling and pitching tombstone in the middle of nothing. What did he fly? That would take a while he went in around 55 retired the late 70s if it had wings he flew it.. ok this is gonna take min in no particular order he flew with SAC and MAC.. F86 ,F84,F100, F105,F106 ,F4, B66 in Europe, DC3, C141, c7 carabou, did fighter training in a T6 Texan.. that's all I remember I know I forgot a couple. When he retired from the airforce he flew the Governor of MI, around in I want to say a Piper chieftain.. Also contrary to what the history books say he was the first pilot to fly an RF4C 100 missions over Vietnam..
An amazing resume and list of aircraft. Thanks! Thank you, I am proud of his service.. Retired full Bird as well..
As you should be! I bet he has some great stories! He did tried to get him to record or write them down would have made a great book.. He passed five years ago .. I'm so sorry to hear this. I wish he'd written a book. I bet it would have been fascinating. The stories I heard growing up I know it would have..
Now that was really something. First the Doolittle Raid and then finding the USS Hornet all these years later. It's is in amazing shape!! 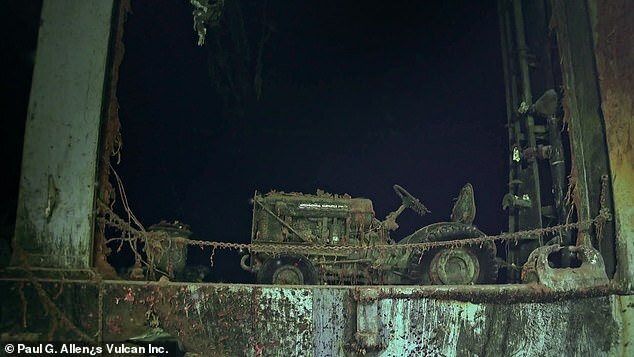 The deep water must lack oxygen to keep the rust at bay?